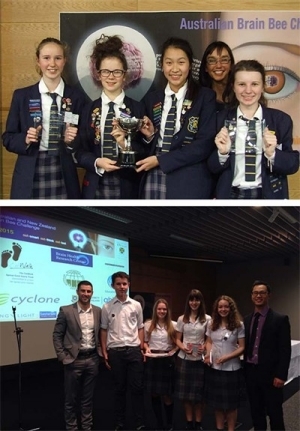 More than eighty Year 11 students from sixteen South Island high schools met in Dunedin on Tuesday June 30 at the Otago Museum for the second round of the Australia and New Zealand Brain Bee Challenge. We are very lucky to have schools all the way from Motueka to Invercargill with a large contingent from Christchurch, making it a very competitive field. The schools receive a travel grant to assist in the costs of coming to Dunedin which are not trivial, and we really appreciate this travel support from The CatWalk Spinal Cord Injury Trust. The challenge is a very important addition to the science experience of these keen young students as it introduces them to neuroscience, a topic which is not part of the high school curricula. Round one (held during Brain Awareness week) was an online quiz hosted by Education Perfect, and from this, students were selected to come to Dunedin to take part in round two. This competition is New Zealand’s only neuroscience competition for high school students. The students compete in individual and team events to find an individual winner who will represent the South Island in round three, the National Final held in Australia. The Australia and New Zealand winners of that round will go on to the World final, the International Brain Bee Challenge. The 2nd and 3rd placegetters in the individual competition are well rewarded with a place in ‘Hands on Otago’ where they can experience a week of science in the summer vacation. The team event produces a winning school that receives a prize sponsored by Cyclone Computing with the 2nd and 3rd placed teams received Education Perfect prizes, making all these team members very popular with their teachers. While in Dunedin the students get many opportunities to experience what being a student at Otago University may be like. They attend short lectures from some of Otago's leading neuroscientists and take part in an interactive “NEURO 101” laboratory session using one of the teaching laboratories used for First Year Health Science classes. This entire experience is really exciting for the students as it allows them to gain insights into working in neuroscience and exploring potential career opportunities.